Games Workshop has lost its mind. Would you like to play as Space Marines? Would you like to play all of the Space Marines? Well GW has an offer for you. 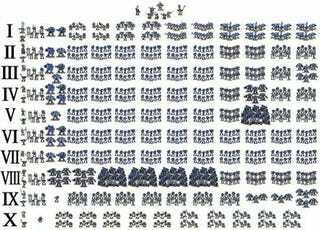 For the low price of $11,000—yes, that is eleven thousand, not a typo, you can easily order the ENTIRE chapter of the venerable Ultramarines. That is, for the record, nearly 1,200 models. Unpainted, unassembled in case you have nothing to do for the next 3 years. You also get some bonus things like a 'Hand-signed' copy of the Codex, which is a nice gesture from a company that just made an $11,500 sale on a bunch of little plastic miniatures. Or you can just give me 11,500 dollars because you were about to spend it on a bunch of Warhammer figures and seriously the hell is wrong with you?